What would you do if a simple errand takes a deadly twist, turning you from cautious prey to dangerous predator? Someone is trying to send a deadly message to Mason, arranging the deaths of those he loves and it puts the entire pack and Alpha on high alert. Darcy understands the primal instincts driving her beloved Mason's commands. With the help of those he sets as protectors, she learns about herself and the things she'll need to help support her Alpha and pack. When events turn dire however, one truth offers her strength - once given, oaths are unbreakable ... even if it means risking it all. Can you tell us a little about the beautifully-titled Mystic Wolves? 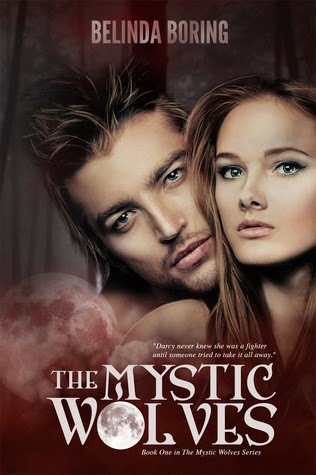 The Mystic Wolves is the first novel in my Mystic Wolves series. It revolves around an already established couple called Mason and Darcy, Mason being the Alpha of his Pack, and Darcy his soon-to-be mate. Life was going pretty well for them until a last minute errand into Woodside Hollow, the town the live, turned into tragedy. Mason and Darcy must deal with the event and draw on each other's love and strength. Unfortunately, the attack was part of a plan against Mason. As the reader experiences the story with Darcy, (the story is told from her point of view) they see how even when things fall apart, loyalty and love can carry you through anything. It came from a dream I had of the attack that takes place in the beginning of the story. My best friend encouraged me to write it down because I couldn't shake the emotion I'd felt. I did and Darcy was originally human. I was an avid paranormal romance reader so it was a choice between her becoming a vampire or werewolf. I loved Kelley Armstrong's Otherworld series, so she became a wolf. It's been an incredible journey writing each book and putting my own spin on things. The Mystic Wolves is the first book in a series that currently has four books, plus a companion novella filled with Christmas memories. I'm almost finished with the 5th book, Savage Possession, and the series currently has 12-13 books planned. Crazy, huh? All from a dream. If Mystic Wolves was made into a movie, who would you like to play the main characters? Why do you love writing paranormal romance? I love writing the kind of stories I love reading. Paranormal romance has always appealed to me because they seem so intense and bigger than life. I love the idea of magic and special abilities, of having strength beyond my own, and the mystery of it. As an author, I love that I can create my own worlds with my own rules. I have more freedom to explore. What is it about werewolves you find so intriguing? You're not one, are you?!? Hahaha I think it would be pretty awesome to be a werewolf. I love the idea of cutting lose and running, over having the cares of the world just fall away where it's just you and the earth. I think that's what drew me to them at first--their balancing the animal nature with their humanity. I've loved developing my own lore surrounding them along with different rituals. I love Pack mentality and the security that comes from it. I liked writing but I didn't have much confidence in it. I always joked ifI ever wrote a book, I'd typed it up, get it bound, and then put it on my shelf. That's it! It was two good friends who helped encourage me and a leap of faith! For all my anxiety, becoming an author has been the best decision. I've loved every second and can't wait to see what the future holds. Out of my covers, I love them all, but I'm drawn to Forever Changed because of the boldness of the pink. I'm definitely a visually driven reader. A lot of the books I purchase are done mainly because over the cover. If it catches my eyes, I'll buy it. My hubby. My family. My best friend. Authors that I'm grateful to know. Those who touch my life on a daily basis. The world around me. Seeing others overcome challenges. Remembering how far I've come. I always try to look for the good/the positive in everything. Where is your favourite place to write?Right now, anywhere that's comfortable. Usually it's on my couch in the living room or my chaise in my office. Add a heating pad for my back and I can sit and write for hours! Considering I saw it six times, my favorite movie based on a book is Divergent. I'd never read the series before but the movie trailer intrigued me. My BFF and I instantly feel in love with the story and characters, especially Four. We have a HUGE Crush on Theo James. He's definitely SWOONY! My list of favorite authors is always growing: Lacey Weatherford, Airicka Phoenix, Cambria Hebert, Lizzy Ford, Sherrilyn Kenyon, Tabatha Vargo, Raine Miller, KA Robinson, and Jessi Gibson. Mostly because they're so amazing and they're wonderful people. I love how they write and some, I love their work ethics, and their dedication to writing. If you could have a dinner party with any authors and/or characters from any time in history, who would you choose and why? I live in the mountains of Arizona, so no cactus but plenty of pine. It also snows! Great interview Suzy! I've honestly thought about buying a Tadis nightlight, lol. Michelle... a Tardis night light is a FAB idea isn't it? LOL!